Singapore is often considered one of the most expensive cities in the world, and while there are definitely luxurious lifestyle options in our city-state, there are also ways that you can stretch your dollar. It’s all about making small lifestyle tweaks so that you can achieve the financial future you desire. 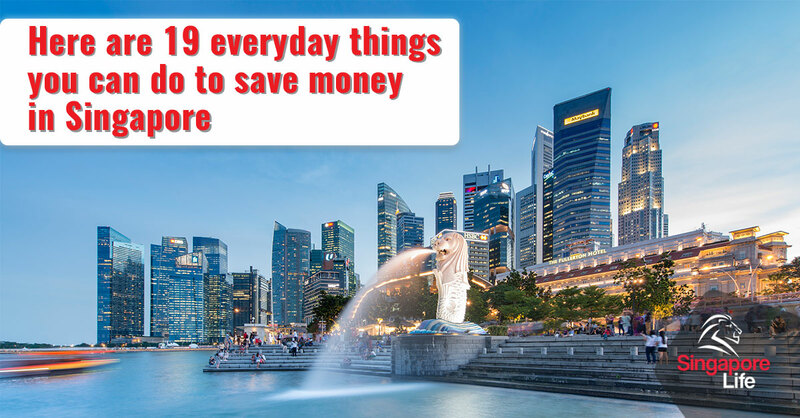 Here are 19 everyday things you can do to help you save more money in Singapore. Going grocery shopping after a stressful day at work can be therapeutic… and also put a dent in your wallet. Instead of going to the supermarket as and when you need to, try planning your groceries on a weekly basis. Create a list of what you need for the week and head to the supermarket with the list in hand. A more focused approach to grocery shopping can help your reduce food waste, cut down shopping time, and save you money. Online shopping and sales can be a mighty temptation, and it’s easy to make an impulse buy when all you have to do is hit the “Buy” button and your credit card information is auto-filled. Remove this temptation by not storing your credit card information online. It’s also better for your online security. Not everything we buy has to be brand new, and some great deals can be had in the second-hand market. For instance, pre-loved items can be a great option when you’re starting a family as it can help cut the costs associated with raising a child. You can check out flea markets or, better yet simply browse on Carousell while in comfort of your own home. You can also consider reaching out to friends and family to see if they have the items you need, and are willing to either loan it or give it to you. Those promo codes on Grab may feel like you’re getting a good deal, but even small amounts of money can add up. Instead of always opening up your Grab app, consider taking the bus or MRT when possible. Singapore has one of the best public transport systems in the world, so take advantage of it and save some money. Save money and the planet by bringing your own bottle of water instead of buying one each time. Sure, a bottle of water often only costs $1 but in the long run, that’s a lot of money. If you bought a bottle at $1 each every day for a year, that’s over $350 just on bottled water. Invest in a water bottle that you like and start the habit of bringing it everywhere you go. A “branded” latte sets you back about $6, whereas a local cup of coffee is only a fraction of the price. Cut down your expenses by giving your Starbucks Gold card a break, and start getting friendly with the auntie or uncle at your nearest kopitiam. You may have noticed that certain vegetables in the supermarket are more expensive than others. That’s likely because they’re imported, which hikes up their price tag. Instead of reaching for that head of broccoli from Australia or the bunch of celery from the U.S., try opting for Asian greens instead. In most supermarkets, a thick bunch of Asian vegetables only costs between $1 to $2. As a haven for foodies, there’s no shortage of food options in Singapore — and most of it is very affordable. That $12 set lunch at a restaurant may sound like a steal, but you can also have a delicious hearty meal at the hawker centre or food court at half the price. Make date night or a family outing to the movies more affordable by utilising promotions. Do some research on movie promotions by checking out the cinema’s website. Some credit cards have on-going arrangements with certain cinemas and offer promotional deals. You can also be more strategic about when you watch movies. It’s cheaper to watch movies on weekdays than weekends, and certain blockbuster movies have a higher price tag during opening weekend so wait a few days for the prices to go back to normal again. Improving your fitness doesn’t have to mean spending a large amount of money. Save the money you’re spending on your gym membership or yoga studio package and start doing home workouts instead. If you live in a condo with gym facilities and a swimming pool, make use of the facilities as part of your fitness regime. Alternatively, there are many free workout videos on YouTube that you can try. Saving money doesn’t mean not having any fun; it’s about making smarter choices. Next time you’re planning a get-together with friends or relaxing with colleagues after a hard day at work, take advantage of “Happy Hour” deals for drinks and food. Thanks to “Happy Hour”, you can save money without sacrificing your social life. Instead of going to the mall (where you’ll inevitably spend money shopping) or shelling out entrance fees for an attraction, choose fun and free activities for your family. For instance, you could get out to nature and enjoy the sunshine by checking out Singapore’s nature reserves and national parks. Singaporeans also get free entry to our museums so brush up on our local history and culture by taking your family to one. Here are more ideas on fun and free stuff to do in Singapore. If you cook at home regularly or often have leftovers, consider bringing a packed lunch to work. This can be a big money saver, especially if you work in the Central Business District where the average cost of lunch is $10. Instead of joining long lunch queues at the food court, opt for some peace and quiet as you enjoy your homemade lunch in the comfort of your office pantry. Hone your bargain-hunting skills and look for cheaper deals online instead of paying full-price. Check out deal websites such as Fave which offers discounts on everything ranging from beauty to travel to activities. These discounts can save you anywhere from 10% to 90% of the full price. Be a savvy deal hunter by checking out the reviews of the company before you purchase so that you know what you’re getting for that price. Challenge yourself to only use cash and leave your cards at home. This can be a good challenge during the work week to help you control your spending on food and any lunchtime shopping you may be prone to doing. Cut down your monthly expenses by being more mindful about your use of electricity and water. Instead of using air-con in your home all the time, trying using the timer so that it shuts off at specified times. Switch off appliances when they’re not use, and turn off the tap to use less water when washing dishes, taking a shower or brushing your teeth. Buying in bulk is a great lifehack for saving money in Singapore. Bulk buys works best for non-perishable household items as you can store them for a longer period of time without worrying about expiry dates. Check out places like Fairprice Warehouse Club and BigBox for affordable bulk buys. You could split your bulk purchases with family and friends so that everyone can enjoy the bargain. Addicted to Netflix? Can’t live without Spotify? Save some money on these services by sharing a group account with family or friends. A Spotify family plan can be shared by 6 accounts and costs $14.98 whereas you’d pay $9.90 individually. Instead of blindly paying premiums for your life insurance policies every year, take the time to review them. Review the benefits that you’re eligible for, evaluate if your life insurance needs have changed, and check if you need additional or new coverage. As the insurance market is competitive, insurers often offer new benefits or upgrade their plans in order to provide more value to consumers. Check if you’re sufficiently covered and if there other types of policies that can better protect you and your family against the uncertainties of life.